The updated kitchen offers granite counter tops, newer appliances, and all utilities you will need for your visit. Opening to the beautifully decorated living room, here you will find a large wall mounted flat screen TV and access to the balcony offering sensational beach views. Enjoy colorful sunsets, a good book or just sit and soak in the sun from this one of a kind vantage point! All three bedrooms have plenty of space and privacy! The master bedroom has one king sized bed with private door to walkout balcony, and television. The second guestroom has two queen beds, and television, while the third bedroom has two single beds. All together, this is a great rental for couples or larger families up to 6 people. As with every SunHost property, linens, extra towels and pillows are all stocked, and ready for you upon arrival. Washer/dryer in unit. This unit offers two parking spots, and is a non smoking rental. This unit requires a $300 refundable damage deposit. This unit has a seven night minimum stay and a maximum occupancy of 6 persons, including infants and children. Across the street from this unit is popular John's Pass Village. The Pass is a quaint turn-of-the-century fishing village and Pinellas County's number 1 tourist attraction. The Village has over one hundred unique shops, a variety of restaurants, the local fishing fleet, dolphin watching and shelling tours, boat rentals, parasailing and jet skiing. Best of all as a SunHost customer you can walk to this great entertainment destination. Anchor tenants include Bubba Gumps, Hooters and Hubbards Marina and also world famous Bamboo Beer Garden. 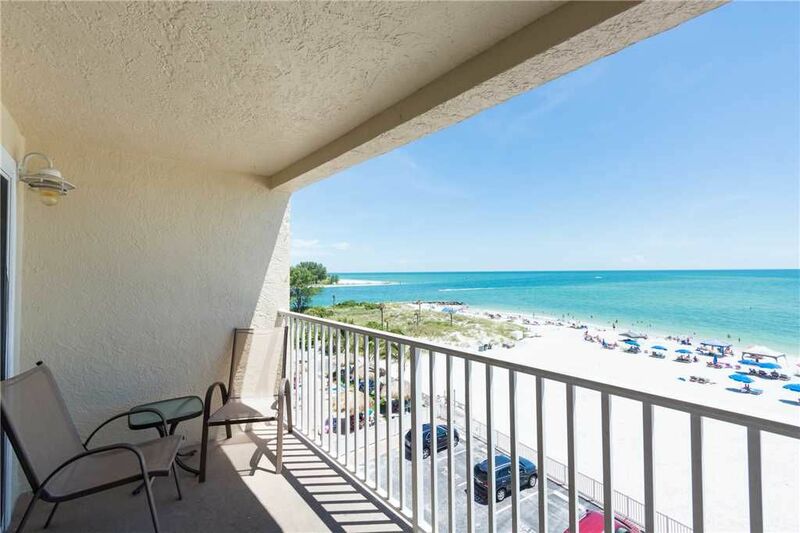 Madeira Beach is a sought after community, just west of St. Petersburg. It's 2.5 mile beach is popular with sun lovers and offers some of the best fishing in the area. This Gulf getaway has something for everyone, including dolphin watching, water sports along some of the most beautiful crystal clear waters in the world. Nearest airports are Tampa International Airport at just over 20 miles and St. Petersburg Clearwater International at 10 miles away. I loved the location. The condo was very nicely decorated. However, the internet was very spotty. The kitchen needed more cookware. Love this building, unit and location. Works out great. Property was nice. Views of gulf sunset are amazing. Excellent location! I booked #411 (king, king, 2 queens & tv's in all 3 bdrms) but we were switched to #408 (king, queen, 2 queens & tv's in 2 bdrms) the week before our trip. I wasn't happy with switch since I book based on reviews, photos, bed sizes, tv's...SunHost considers this to be a reasonable switch. We all fit and we don't go on vacation to watch tv so it worked out fine for us. The rooms were nice, bedding was comfortable but the light switches didn't connect to a light. It would be nice if they worked. We've rented houses and condos in the past and have always been provided with beach/pool towels, toys and chairs. Not here. You'll have to bring your own towels. There is a guy on the beach renting chairs and beach toys. Chairs are $5 each and toys are free with chair rental. Wish we knew this before we bought our kids beach toys. Kitchen was good and had most of what you would need. Except pot holders. Also, there was no cleaner for the counters and stove after we cooked. Overall, we had a great time. A few minor fixes by management would make it even better.